As 2016 – the tenth year of Alabama Launchpad – comes to a close, the Economic Development Partnership of Alabama team is focused on the next decade. Ecosystems for supporting entrepreneurs are evolving all across the state. This is exciting news and creates tremendous opportunities for local and state advocates to partner and bring more resources to startups. As more idea competitions, startup weekends, co-starter subscriptions, accelerators, angel networks, mentoring networks, startup CEO breakfasts, and various other support systems arise, building connective tissue to deepen the impact of all this energy has never been more important. Inspired by results already of the nascent Shoals Alabama Launchpad Regional Pilot, the Economic Development Partnership of Alabama Foundation Board voted last Friday to roll out the Regional Alabama Launchpad program. This new program is optional, and is designed to complement local programs. It can be plugged in to a rural or metro area, and is focused on helping communities identify entrepreneurs that may be under the community’s economic development radar. The Economic Development Partnership of Alabama can also help communities map existing programs along the capital continuum, identify gaps in the innovation ecosystem, and prioritize new initiatives. One specific opportunity with the Regional Alabama Launchpad program is the alignment of a local startup competition that can become a feeder to the statewide Alabama Launchpad. For communities that demonstrate collaboration among the existing support networks, there are funding match opportunities. 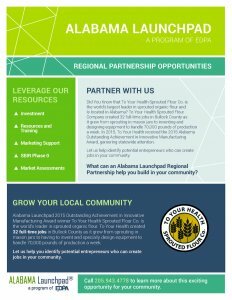 For an overview and details on establishing a regional Alabama Launchpad, go to www.alabamalaunchpad.com/regional. You will find a downloadable brochure and a more detailed overview of the requirements to become a regional partner. Between the dates of December 6, 2016 and January 20, 2017, communities may ask questions about establishing a regional Alabama Launchpad, provide comments on the detailed overview, and request meetings with the Economic Development Partnership of Alabama team. On January 31st, a Request For Proposal (RFP) will be released for regions to apply to participate. The criteria are outlined in the downloadable overview on the Alabama Launchpad website. Applications will be accepted on a rolling basis starting February 1, 2017. On January 31st, EDPA and The Shoals Alabama Launchpad will co-present on the evolution and early results from the 2016 pilot in The Shoals at the EDAA Winter Conference in Montgomery, Alabama. To see the full EDAA agenda, please click here.